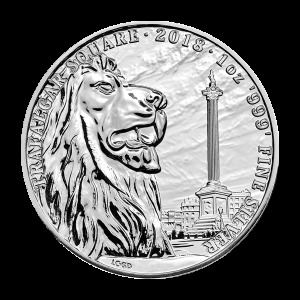 Obverse a tiger roaming in its natural habitat. Reverse A artistic rendering of a map of Korea using letters from the Korean alphabet. a tiger roaming in its natural habitat. A artistic rendering of a map of Korea using letters from the Korean alphabet. 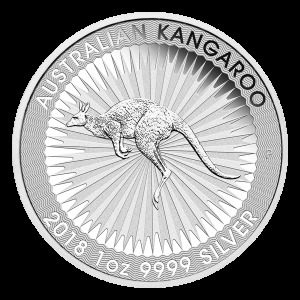 1 oz 2018 South Korean Tiger Silver Round Purchase your 1 oz 2018 South Korean Tiger silver round from our online store and we'll make sure you pay the lowest price on the web! 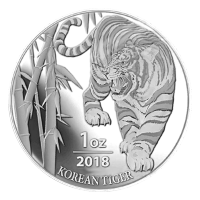 First seen in 2016, this 2018 release marks the Korean Mint or KOMSCO's first silver edition of the beautiful South Korean Tiger round. The obverse feature is an intricate and crisp portrayal of the Korean tiger, at home in his bamboo forest habitat, one can almost feel the deep resonance of his growl as he surveys his surroundings for his next unsuspecting meal. 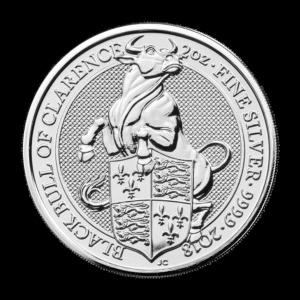 This striking feature is joined only by the coin's title, weight and year of release. The reverse feature is a beautifully designed mosaic of Korean alphabetical characters, set in the shape of the Korean map, with the larger letters in the mosaic perfectly placed to spell out the country's name; the two circles astride this mosaic feature an anti-counterfeiting measure and the symbol from the country's national flag respectively. A frame surrounds this feature, beset with decorative tiger stripes, as well as the Korean legend and the rounds purity. Although a tiger has not been seen in the South Korean wilds since 1922, the nation has long been hailed one of Asia's 'Four Tigers,' along with Japan, China and Taiwan. 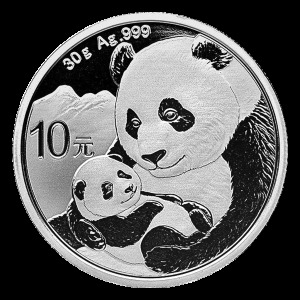 Celebrate the might and myth of majestic South Korea and diversify your portfolio with a 1 oz 2018 South Korean Tiger silver round today!